Five months after its formation on 29 January 1799, the Neapolitan Republic was teetering under the combined onslaught of Cardinal Ruffo's popular, royalist army of Sanfedisti recruited from the bellicose peasants and bandits of Calabria, and the Lazzaroni, poor, unemployed, but devotedly royalist Neapolitans. Into the blue background of the bay slipped Nelson, ready and willing to castigate the defeated Republicans on the orders of the Neapolitan monarchs. The aftermath was brutal and bloody and served to show what would have happened in France had the aristocracy ever regained power. Revolutions followed by counter-revolutions, blood-lettings and heavy handed repression: it all sounds rather par for the course until it becomes clear that those who may have stood to gain the most from the end of the monarchy had fought tooth and nail to defend it. And those Republicans put to death, imprisoned and exiled for their part in establishing the Republic were not revolutionaries from the lower social orders but lords, gentlemen, generals, admirals, writers, poets, scientists, philosophers and lawyers. Among them were names from the most respectable Neapolitan families such as Caracciolo, Filangieri and Pignatelli; indeed many of the young men who withstood siege in Castel dell'Ovo were more familiar with the feel of vellum than the muzzle of a musket. Benedetto Croce ( 1866 - 1952), Neapolitan man of letters, was convinced that this class of intellectual revolutionaries had its origins in a southern Italian political tradition formed in the 17th century by such men as Tommaso Cornelio, who in 1649 brought the work of English and French philosophers (especially Hobbes and Descartes) to Naples, and Giuseppe Valletta, who made public his collection of 'books written in free countries' and initiated relations with the Royal Society of London. Many Neapolitan academics embraced the philosophy of Descartes and from the ensuing battle between these Cartesian Rationalists and the previously dominant Aristotelian Schoolmen there arose a new, enlightened, political class.This class was strongly anti-Jesuit in nature and gave rise to a religious and political freedom in Naples, which was the envy of many who lived in states where freedom of thought and expression was heavily suppressed. Armed with their faith in Reason, the new middle-class intelligentsia pushed for far-reaching reforms in such varied fields as religion, economics and land law. Naturally, there were martyrs along the way but there were many reforms achieved in the 18th century which sought to undermine the power of the barons, the Jesuits and,in the words of the Archbishop of Taranto, 'popery, the perpetual enemy of the Kingdom'. From 1734, the Kingdom of the Two Sicilies was ruled by the Bourbons and many reforms were carried out during the rule of Charles III. But it is perhaps in his successor, Ferdinand, that we begin to understand how an absolute monarch could find such unexpected succour from the unenlightened, uneducated masses who had groaned for centuries under the yoke of a feudalism which the Republicans hoped to lift from them. Ferdinand was known as the Re Lazzarone; a popular king with a common turn of speech and manners, in whom the common folk could find an affinity; a monarch dedicated to hunting, gaming and houseparties, who appealed to the plebeian nobleman - a man's king, and so more appealing to the lower classes than the highbrow intellectuals and academic activists who by 1792 were catalyzing into the conspiratorial Jacobin societies which would eventually form the Republic. 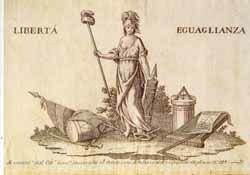 Within three years of the French Revolution, Neapolitans were corresponding with French Patriotic Societies, and soon masonic lodges in Naples were forming into Jacobin 'clubs' where a conspiracy grew to overthrow the monarchy. Upon its discovery, the leaders of the plot were either imprisoned or exiled. Those who remained went to ground. Many of the exiles went to serve as soldiers or advisors in the French Revolutionary Army. For those Jacobins who remained in Naples, January 1799 promised the realization of their dreams. The victorious French army was sweeping down upon Naples, its ranks bolstered by Neapolitans, and the Royal Family had fled to Sicily the previous December. Castles were quickly occupied and the Republic declared. The founders had problems from the beginning: insurrection was rife among the lazzaroni; the businessmen of the Kingdom, grown rich on reforms, were too occupied with their profits to take much notice; and there were difficulties in rallying the provinces, where the king had always been a distant but shining light, untainted by the warts which proximity would have shown. Faced with such problems, the Republican government never managed to implement any administrative or legislative programme. The monarchs' reaction was to despatch Cardinal Ruffo to Calabria to drum up a popular army with which to retake Naples. Events in France had shown them that they were on fundamentally different sides to the reformers whose flag was now fluttering from the bastions of Naples. This was despite the reforms which had been achieved through collaboration between the two sides. Furthermore, the monarchs had by now entered into alliances with conservative powers, namely England (see Lord Nelson and Lady Hamilton), Austria and Spain. The struggle for power was extremely fierce and has been described as a religious war between Jacobinism and the old, superstitious, monarchic religion --and like all religious wars it was pitiless. The lazzaroni had shown their devotion by delaying the French entry into the city; Cardinal Ruffo's army and other zealots who attacked the Republican city were called Sanfedisti (defenders of the Holy Faith), and his Calabrians (whom even Napoleon expressed fear of) are reputed to have seen the campaign as a holy war waged against infidels. As soon as the French army withdrew to the northern theatre of war, the Republic fell to the legions of Sanfedisti and lazzaroni, who began sacking the city then applauded the punitive measures taken by the monarchs and the English against the Republicans. Naples, but a very different one, returned to Ferdinand, who was able briefly to set up throne there until the return of the French and rule by Joseph Bonaparte (1805 - 08) and Joachim Murat (1808 - 15); But such had been the peculiar nature of the Parthenopean Republic that, whilst in France a sign of nobility was to have lost a relative to the guillotines of the Terror, in Naples it was to have lost a forebear to the Jacobin cause.